Before heading out to a car dealership there are some important things you should know. Once you get there, you'll be excited and your adrenaline will be pumping as you are surrounded by rows of the hottest new cars. You should prepare yourself in advance so that you'll be able to look past all the distractions and focus on what is really important. It is extremely important to follow this advice if you are negotiating in person. Once you sign the contract for your new car, it's nearly impossible to get out of the deal. Find your lowest deal before you sign, not after. Don't take the word of a salesman that other places can't match their price. Every time I've heard that, I have proven them wrong. Make sure they see "The Folder" with research and quotes which ww will talk about in a second. Show them you did your homework and you know how to get the best deal possible. Once they know they can't trick you, business will be conducted on your terms. Make sure The Folder has invoice pricing of all the options on your car, printed out from our car pricing section. Having all of your ducks in a row will make your hunt for a good deal much easier. The salesman wants you to be distracted and unprepared so that you'll be primed for their tricks. Start by gathering all of the items I recommend to bring with you. Extended warranty quotes for the cars you are considering. A great deal can turn bad quickly if you buy overpriced coverage. As you enter the dealership, remember your goal. Get pricing and option information from the MSRP sticker, find out what options your car is supplied with. Write down all the option packages, you'll need this information later to form your offer. "What if I told you that you can drive off today with no money down?" "Let me get this straight, you don't want to save over $1,500?" "What will it take to put you in this car today?" Tell Them "Even if it was free, I wouldn't buy today, I'm weighing all my options." To emphasize from the discussion about "The Folder" above, you should definitely have your Guaranteed Savings Certificate from TrueCar with you. You select the make, model and option package and you will see the TrueCar Curve. The Curve shows you what others in your area have actually paid for your model and trim level as well as the MSRP and invoice price. There will be an option to get the Guaranteed Savings Certificate. It will give you a baseline price for negotiating and the best part is that you don't need to talk to anybody to get it. If you forgot to bring it with you, you can just bring up this page on your smart phone, click this link and get your Certificate right there on the lot. 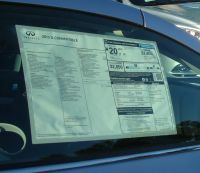 Every new car is required by law to have the factory MSRP sticker on the window. Only the buyer is allowed to remove it. If it's missing, report it to the Attorney General's office. One man in Ft. Lauderdale bought a car with no MSRP sticker so he couldn't verify options on the car, taking the dealer's word for it. He paid $1,500 for an option that wasn't on the car. When he confronted the dealer, they told him verbal contracts are unenforceable and refused to deal with him. Moral of the story: Never buy a car without an MSRP sticker (also known as the Monroney sticker). During the test drive they want as much information out of you as possible. Anything you say will be used against you. They want to know what monthly payment can you afford and they want your trade-in. Tell them nothing. They are conditioning you as a payment buyer. They determine what payment you are happy with, shielding you from the selling price. Tell them you don't deal that way, you negotiate based on price, not monthly payments. Test drive on a hot sunny day to test the AC. Is it cold? Does cool air reach back seat? Always inspect the car in daylight, not in the dark, for any nicks or dents. Inspect the paint and make sure it's in good condition. Take a picture of the pricing and package/option information from the manufacturer's sticker so you can look up dealer cost including the options. Ignore the dealer's sticker. Get the sales person's card, thank them and tell them you'll be back. Don't let them try to sell you at this time, as you are unprepared and they know it. If they try to create a sense of urgency for you to buy today, ignore it. The "urgency" is for them to sell and not let you walk out of there. Salespeople need your Euphoria! During the test drive don't act excited. They'll say "Isn't this great"? feeding the euphoria and they have you hooked. All you want to do is get the pricing info. If they turn on the radio, turn it back off. You want no distractions, while listening for strange vibrations or rattles. Music from the radio may get you in a partying mood, which you don't want. Act flighty and indecisive, unimpressed, go back and forth between liking sport and sedan. They can't figure you out, and they don't have you in a spell. Whoever is asking the questions controls the conversation, so you ask all the questions. Everything they say is false until you see it in writing. If they don't put it in writing, it means they won't do it. Ask if the dealer charges advertising fees, dealer prep or other fees. 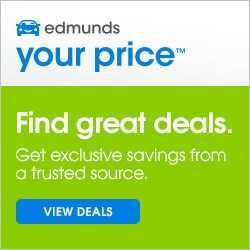 Make sure it agrees with what you found on the car pricing sites. Knowing the fees is important when you end up comparing similar deals. Fees can add up to over $1,000, throwing off all your budget calculations. You must know all the fees your dealer plans to charge so you can factor them into your budget and formulate your offer accurately. Learn about all the types of fees you will encounter in our fee glossary. "Please forgive me, I'm new at this. I've only been selling cars a few weeks." I've heard this every single time. This makes you lower your guard. The salesman knows you'll be at ease, thinking you can out smart him. When you start to negotiate, suddenly he becomes Donald Trump. If your salesman turns out to be a woman, don't underestimate her. Some men wrongly think they can outsmart any woman. As they bask in their ego, she's out maneuvering them. "Sure, Jeff, I'll give you floor mats. The parts department is closed, so stop by Monday and I'll have them." We showed up on Monday, and guess what? Mr. Liar doesn't work Mondays! They refused to give us the mats and Mr. Liar dodged our subsequent calls. If they promise you anything, no matter how sincerely, make them put it in writing. "We'll be back to buy the car when you have the floor mats." "Gee, I don't know what that fee is for, we've always charged it." If they claim they don't know what a specific fee is for, they are lying and you should leave immediately. They just don't have the guts to look you in the eye and tell you it's a bogus fee. If the sales manager gives some obscure story that it's to help offset the cost of giving you discounts, do yourself a favor and leave to offset your cost of lining their wallet. 8. Don't give them your Drivers License or Social Security number! "Dave has your license, he went out to lunch. In the meantime, what can we do to make you sign?" Don't be held hostage! Many new car dealers photocopy your license before a test drive. Tell them there is no reason to. They'll say insurance requires it. Some dealers copy your license "in case you rob the salesman." Other dealers copy your license to run unauthorized credit checks during your test drive. Make copies of your license beforehand and when they ask for your license, hand them the copy and get it back when you leave. Write on the copy the dealer may not run a credit check on you. Many dealers are honest and will photocopy your license on a copier at the front desk and give it right back. But some, while you're out on the test drive, run a credit check on you. Don't give personal info until you have signed the buyer's order and are doing dealer financing. How can you tell if they ran a credit check on you? Get your report online from one of the big three credit bureaus. You can run your own credit report as often as you like and it will not lower your credit score. Experian.com - Owned by the Experian credit bureau. TransUnion - One of the big three credit bureaus. Don't lie about the condition of your trade in. You wouldn't like it if it happened to you. Don't waste the salesperson's day car shopping if you have a recent bankruptcy. You won't get auto loan approval. Don't put down a deposit and try to take it back for no reason. Don't lie about your income or debt load. They run your credit report to verify it. Don't make an unreasonable offer without actually knowing the dealer cost. Don't spout off how the salesperson is making $3,000 on the deal. If you're getting a good deal the commission is pretty low. Don't pay cash for a deposit on a car! If the transaction goes bad, you'll never get your money back, but you can dispute a credit card charge. You may need a new, clean credit card to handle deposits, and purchases, don't pay cash. What if you can't get credit at all and keep getting rejected? Don't keep applying to credit cards, get rejected, and your credit history damaged even further, find out who will approve you before you apply. They find at least 2 credit cards guaranteed to issue an unsecured credit card to you. If your credit is so bad and If you're in too deep, maybe now is not the time to buy a car. Now it's time to find out what the dealer really paid for your car in the pressure free comfort of your home. To get the exact options and colors you want, you may have to order from the factory through the dealer. It takes 6-12 weeks. Make sure to keep a copy of all signed agreements to verify the price. Note: Some rebates require the vehicle be in stock. Sometimes a dealer can find what you are looking for at another dealership and have it transferred. Keep in mind that you are likely to be charged to transport it which is perfectly fair. Just make sure the charge isn't too high.